In my experience, if you give the kids crayons, they’ll instinctively look past the reams of paper you’ve left out and use the freshly painted white walls in your dining room as a canvas. Do they just want the painter to visit? Do they enjoy disobeying you? Is this early onset adolescence? Or are they trying to save the trees? We’ll never truly know, but it seems they always find decorating the walls a fun and suitable pastime. You can use any tape to stick your contact paper sheet against the wall. We used masking tape, because it’s quite sticky but doesn’t leave any marks. You don’t have to stick the contact paper up on your walls – sliding doors work too and they’ll get excited by the fact that they can see through their canvas. For these particular activities, having the sticky side of the contact paper facing outwards worked. But there are other activities, for example, those that can have them drawing with a whiteboard marker that they can erase, which works best on the reverse side. So decide your activities before creating your stations. 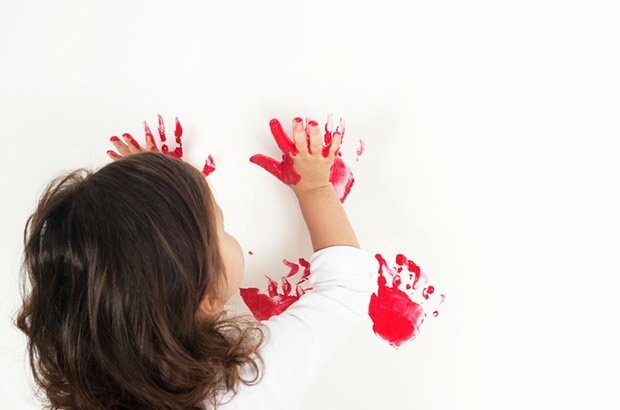 We wouldn’t suggest sticking the sticky side of the contact paper directly on your painted walls though. How do you keep the kids occupied at home? Any creative ideas you've come up with that you'd like to share with us? Tell us by emailing chatback@parent24.com and we may publish them on the site. Don't forget to send pictures too!